Delivering your finest performance on the badminton court requires hours of practice – and of course a great racket. In this comprehensive assessment and buying guide, we help you with the latter. At the end of this guide, you will be able to make a well-informed choice on the best badminton racket you could get to suit your playing style and shot preference. The game of badminton does not require you to purchase much equipment, though it’s important that the racket you select is good quality. Unlike the early days of this game when racket frames were only made of wood, you can now find them in various materials to help you improve your game. Knowing what to look for in a badminton racket can be tricky, especially with all of the various options available. We’ve highlighted the best ones that each excel in a specific area to help you narrow down your selection. If you want our final vote (without all the reading), the Yonex Voltric Z-Force is the top overall racket for badminton. This comes as no surprise, of course our overall best pick has to come from one of the leading brands in the game, Yonex. This one’s the Voltric Z Force II and in our opinion is the strongest and most powerful contender in the bunch. This set can come with or without strings and is available in two sizes, with variations in its firm grip handle and string tautness. Using the NG98, the racket comes in at 24 lbs, while the second option comes in a stronger, more durable 26 lbs with the NG99. It’s shaft and frame are extremely lightweight yet surprisingly stiff, and it’s ultra-aerodynamic shaped head allows for increasing power with swing of an arm. This prevents the deceleration of shuttlecock speed with non-stop swings and movement, allowing for consistent and controlled power. Unlike other rackets and sets you will get to see in this buying guide, this doesn’t have any more inclusions other than the signature Yonex carrying bag. Regardless of the situation, we think this tops our list because of the features and specifications it offers for the price you’ll be paying. At first glance, the racket is a slick dark gray overall with some blue and light gray highlights for a clean, and cool aesthetic. Thanks to the control support cap, this racket has a very firm and wide grip handle efficiently providing 88% more flat surface for an easy to use hold and application. Other than that it also has solid feel core that minimizes vibrations felt when hitting the shuttle. This, coupled with the help of the new voltric sound filter on these rackets, an additional 31% of the vibrations felt on the grip is decreased, effectively aiding in providing louder and sharper sound waves by taking out the duller, high-pitched sounds created when hitting. As for the head, this part of the racket’s heavy construction is balanced by a smaller frame to help maintain the speed and strength required by professional players for heavy smashes and hits during play. New Tri-Voltage System built frame combines exceptional power and superior handling, with added tungsten for controlled flexibility and maximum transfer of swing power to the shuttlecock. Single pass grommet holes on the frame allows for more accurate and stabilized string tautness, unlike conventional rackets that provide lower performance string power. New Built-in T-Joint that connects the head and the frame together. Provides more powerful and lightweight support that is quality enhancing and allows for torque-free strength. New Nanometric material used for the carbon fiber bonding in the racket frame, taking shaft construction to a whole new level of durability. This also makes it almost 60% thinner than traditional rackets while maintaining the durability required in heavy game play. 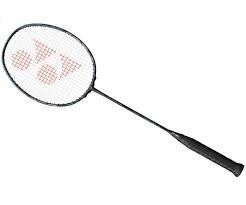 Overall, this is a great racket that definitely ticks the boxes professional badminton players are looking for. With that said we think this racket would be best for intermediate and professional players who are looking for a higher-end companion that can complement their skills and techniques on the court. It can still work for beginners who are looking to find a racket but this one’s features isn’t the most necessary for those who are just starting out with the sport. This Made-in-the-USA Wilson Matchpoint Badminton Racket has a low price point and yet offers superior quality, good enough to qualify for beginners looking to up the ante on their game. Weighing in at just 105 grams without its strings (and 120 grams once strung), this is a lightweight racket which most beginners will find easy to maneuver. Its bright yellow color is likely to appeal to most buyers. The racket has reasonable durability, thanks to its grommets which are flared inside. Further, its two-piece aluminum frame adds an extra touch of strength and sturdiness to the racket. Hyper carbon-steel has been used to make the racket which makes it all the more sturdy and strong, while still ensuring that it does not end up being too heavy. 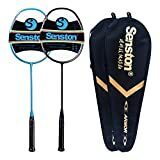 Unlike the Trained Premium Quality Set of Badminton Rackets that we reviewed previously, this does not come as a pair of rackets, or have shuttlecocks or a carrying bag. This is just one single racket; if you need a pair to get going, you will need to buy two of these. Does that come across as a con? Not really, purely because of the low price point at which this racket is offered. The key aspect to bear in mind consistently would be the fact that this is a highly regarded racket for beginners. Therefore, as you progress in your game, you can always gravitate towards a more premium badminton racket. Till then, this will definitely do just fine. Moreover, with aesthetics making a big difference these days, from a looks p-o-v – be it the attractive design or the bright yellow color, this is a racket whose appeal is clearly long lasting. While reviewing this racket, we tried out a variety of shots especially smashes to test its endurance. We found the racket playing out quite well, with even the heaviest of smashes not having any impact on its strings. Accordingly, we do opine that this racket has a solid build with its strings firmly strung onto it. This is important since you will never have the necessary peace of mind if you’re constantly worried the racket will break or come undone when least expected. As far as we are concerned, in spite of all the rigorous tests that we undertook on the racket, there was no negative impact on its state. When it comes to top beginner badminton rackets, Wilson Matchpoint Badminton Racket comes up trumps. This is especially true when you are starting out casually, say to play badminton in your backyard. As you go pro with time, you can easily graduate to a more sophisticated racket. Till then this racket will do the job for you really well. Our final words would be that if you and your opponent are both beginners, you can consider getting two of these rackets, see how you are able to improve your game with practice, and then gradually ease your way onto a superior racket. This is a Yonex that comes in at an affordable price point while still offering (expected!) superior quality. Therefore, when it comes to a good choice for the top-rated badminton racket for intermediate players, we recommend this Combo Set Yonex Badminton. The set includes two rackets and a tube that contains two white color nylon shuttlecocks, all of which are enclosed in a neat carrying case with a strap to easily fling over your shoulder. Once the case contains both the rackets as well as the tube with shuttlecocks, it does tend to get a little tight. We would have preferred the case to be a little more flexible in its design than the way it is currently. Both the rackets come pre-strung at a strength that is solid enough to ensure long-term durability. Moreover, being pre-strung these rackets are ready to use from the get-go. While reviewing these badminton rackets, we subjected them to intense back and forth vollying to test their endurance. Even after many sessions that lasted hours – over weeks at a stretch, we found no visible impact on these rackets. This may have a lot to do with the material used in making these rackets since the frame and shaft are both made of steel. On the flip side, this does tend to lend reasonable weight to the rackets since they are not very light (without being uncomfortably heavy). In fact there were numerous occasions when these rackets were exposed to the elements, including heavy rain and intense heat. In spite of that, when we picked these rackets up to play, there was no visible impact on them. Performance-wise too, they were spot-on. From an aesthetic point of view as well, you are likely to find these rackets appealing. This was obvious to us when everyone around was rather curious about the make of these rackets, purely based on their looks. Colors, in particular, made a big difference since these rackets come in various shades that include green, yellow, and white. Talking about the grip on these rackets, it is firm and non-slippery. So even during an intense match, especially with a lot of back and forth volleying, you are unlikely to face any issues. So taking all of these aspects into consideration, when you are on the lookout for a suitable racket that will qualify for your intermediate level of play, this Badminton Combo Set from Yonex will very likely make the cut. As you progress towards professional stature, you might want to consider more advanced badminton rackets. While Yonex has a fairly wide variety of badminton racket models on offer, when it comes to choosing the best Yonex badminton racket, we recommend going for the Yonex Nanoray Series. This racket comes pre-strung at a superior level of strength and tightness. So not only is it ready to use from the outset, you can be reassured that it will remain taut for a fairly long time. While reviewing the Yonex NANORAY series racket, we had players at multiple levels of proficiency subject it to some really intense sessions of play. What we found is that irrespective of the level of the player – from beginner to intermediate to pro, they were all able to adapt to this racket well. 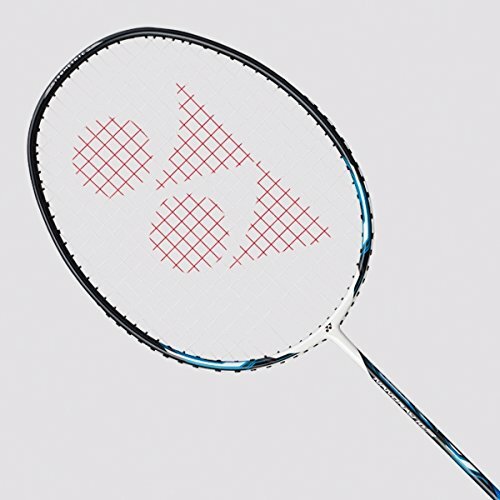 Therefore, we would assert that this racket is suitable for all levels of play (or players) – a major reason for this being our choice of the best Yonex badminton racket. We also liked the fact that the racket is really light which makes maneuverability really easy. In fact, given its lightweight stature, it took us fairly less time to get used to it and play a wide array of shots with reasonable ease. From an aesthetic perspective, this racket scores well since there are multiple colors on offer. After all, this is an entire series of rackets and not just one particular model. The color choices include red, blue, blue/white, black/blue, black/red, black/green, and lime to name a few. No doubt, this wide selection of color choices itself makes for a compelling case in going for this particular badminton racket model. There is a T-Joint built into the racket, where the shaft and the frame connect. Thanks to this T-Joint, the racket effectively has a one-piece frame with added torque-free strength and durability. The Grommet system on these rackets is completely different, offering additional grommet holes which in turn add to the strength of the racket. The binding force on these rackets is accentuated with X-Fullerene which is used in the resin that binds the carbon fibers together. Rebound in the NANORAY series is good due to the presence of Elastic Ti which lends it the elasticity it needs to ensure maximum impact on every swing. The square head shape on these rackets is isometric that ensures accurate shots even when hit off-center. Taking these factors into consideration, we recommend the NANORAY series as the best Yonex badminton racket currently available in the market. This is especially true, when we consider the versatility of these rackets, being good for all levels of players and playing styles. Once onto the badminton court (or even in your backyard! ), you sure want to smash like a pro but you need a racket that lets you do so easily. Accordingly, in our quest to identify a good badminton racket for smash, we zeroed in on the Senston N80 Graphite Single High-Grade Badminton Racquet which will get you smashing far and wide! This pre-strung racket has a Full-Graphite design including the frame as well as the shaft; performance of the racket – smashing included, gets vastly improved because of this. The Senston N80 Graphite badminton racket is lightweight in its construction, weighing just 80 grams. The strings on it are strung at really high tension, in the region of 28-30 lbs. No doubt, these features of the racket make a big difference when it comes to its smashing ability. Moreover, sheer strength is added to the racket thanks to the way the frame structure is designed, with its Isometric square head shape. Nanomaterial used on the strings also provide an added element of strength. Both these factors, in turn, contribute to making this the best smash badminton racket. 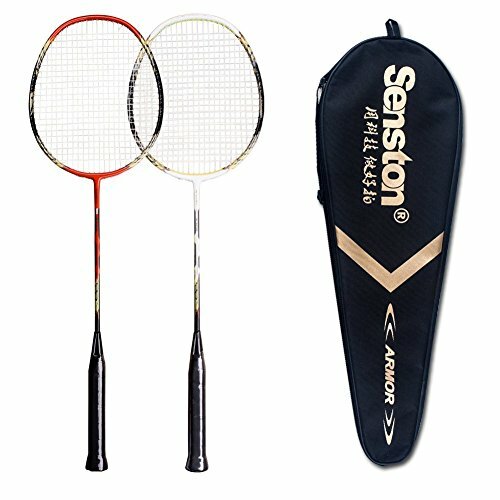 Yet another added feature of the Senston N80 Graphite badminton racket is the way its frame has a unique pyramid frame rim design. This contributes to the smashing ability of the racket in a big way since it minimizes resistance to swing, letting you hit the shuttlecock that much harder. At our end we tried smashes with this racket vis-a-vis others we have reviewed here such as the Yonex NANORAY series racket. While smashes on all were fairly satisfactory, the Senston N80 Graphite badminton racket clearly has its edge. Smashing aside, we really like the aesthetics on this racket model, with as many as nine color choices which include black, blue, blue (new design), fashion yellow, green, new gold, pink, purple, and silver. We also like the racket cover that comes with this racket. Unlike many others that come with a flimsy design, the racket cover with the Senston N80 Graphite badminton racket has a solid long lasting build with a strap to easily carry the racket around. 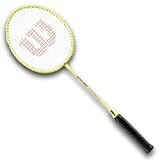 Significantly, the racket comes with a reasonable price tag, notwithstanding its all-round graphite construction or its excellent smashing abilities. This was also a significant factor for us while opting to list this racket here since the price point is clearly very fair. The Senston N80 Graphite Single High-Grade badminton racket is an excellent all-round racket, irrespective of its smashing abilities. Its design, its looks especially its attractive colors all contribute towards making this a very good racket of choice for virtually any style or level of play. At the same time, specifically from a smashing perspective, we found this racket to perform significantly better than other rackets that we reviewed. With this aspect in mind, especially given stand-out features such as its ultra lightweight and Full-Graphite construction, when it comes to the top smashing badminton racket, we wholeheartedly recommend the Senston N80 Graphite Single High-Grade badminton racket. 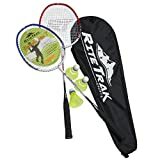 While many badminton rackets, including others we have reviewed in this guide, do qualify for the sub-$100 category, if we are to pick and choose one particular racket that especially stands out as being the best badminton racket under $100, it has to be the RiteTrak Sports FiberFlash 7 Badminton Racket Set. Firstly, this is a one-piece design badminton racket which is completely different to most other options in the market currently. Both the head and the shaft enjoy an easy connection between themselves which in turn gives a sturdy yet immensely flexible grip on the racket. Two pre-strung rackets with color choices that include Orange/Black and Red/Blue. Three nylon skirt shuttlecocks in vivid yellow color, contained within a neat tube. A zippered carrying bag which is light in weight and should be able to comfortably hold your rackets and birdies when on the move. Now, in spite of including all of the above mentioned, the set is actually priced quite reasonably, well below the $100 figure that we have kept as a benchmark in our review. While testing this racket set, we found the grip to be among the most firm that we have seen in rackets reviewed so far. Therefore, if lack of a firm grip has been your pet peeve with other rackets so far, the rackets in the RiteTrak Sports FiberFlash Badminton Racket Set would make a good choice. We also liked the fact that both rackets in this set are lightweight, weighing in at about 90 grams each. Compared to some other rackets, that is significantly lighter. These rackets look good too, and looks certainly matter! Over the course of our reviews, it has to be said that these are some of the best looking badminton rackets, irrespective of being in the badminton racket under $100 category. Value for money for their badminton equipment is a very important aspect for most badminton players, with the majority playing casually for recreation and not professionally. The RiteTrak Sports FiberFlash badminton racket set fits the bill perfectly when it comes to a racket (in this case a pair of rackets) that come well within the $100 budget and yet manage to pack an absolute punch. So if you are value conscious where you do not want to spend a fortune and yet get maximum bang for your buck, then the RiteTrak Sports FiberFlash badminton racket set would meet your needs really very well. Doubles players will love the fact that this Senston – 2 Player Badminton Racket Set comes as a set of two rackets whereby both players can start playing from the get go! At the same time, it is the remarkable way in which both badminton rackets in this set complement each other so well that we have especially opted for this set as our choice of the top badminton racket for doubles. In essence, if you’re a doubles player and would like your partner to have a racket that complements your style of play well, then we would recommend both of you to go for this Senston – 2 Player Badminton Rackets Set. The price difference between these options is relatively marginal. If you are starting out with nothing much to go with, you could opt for the fuller sets listed above towards the end where you get half a dozen shuttlecocks. Our tests on these rackets specifically involved doubles play. In spite of playing aggressively for hours at a time over a period spanning days, we did not notice wear and tear on these rackets. Smashing was really very good and both players could complement each other well while playing. FULL BADMINTON SET AND MORE CHOICES We have different combinations with the badminton equitment…. This sheer solid strength seen in these rackets comes from the carbon aluminum composite materials that have been used in their construction. This material is immensely durable and prevents these rackets from getting deformed even while playing aggressively. We like the fact that the rackets in this set have a unibody or 1-piece design wherein the T-joint is on the inside. This ensures stability for the racket, thus offering players greater control while playing. While these rackets come strung at 20 lbs, they actually weigh just 90 grams when unstrung. So our assessment would be that while they are not the lightest rackets around – especially when compared with some other rackets we have reviewed above, they are fairly light. We appreciated the Graphite shafts on these rackets; they gave us a solid grip which helped our playing style immensely. Having tested them out thoroughly, we would wholeheartedly consider this set of badminton rackets from Senston as the best doubles badminton rackets. So if you are looking for a set or a pair of rackets that are similar in nature and would complement two players together in a team, this would definitely be the ideal badminton racket set to opt for. There would be many features to consider for a badminton racket to qualify as topnotch. In this section, we list out some key features you should keep in mind that render a badminton racket to be a cut above the rest. There is no hard and fast rule for badminton racket flexibility; a lot depends on your style of play. As a beginner though, you would be best off with a racket that is relatively more flexible. As you advance in your game proficiency, you could opt for a racket that is stiffer (or have it more tightly strung). The reason for that is, as a beginner, you need a wider “sweet spot” area on your racket. This is the portion of the string area of your badminton racket which will respond accurately to the shots you hit. Once you graduate from being a beginner to a more advanced player, you are likely to focus more on power, for which a stiffer or tightly strung racket would do just fine. In general, badminton rackets should be light and therefore, lighter the better. Again, as a beginner, you will especially be better off with a badminton racket that is as light (as you can find!). Talking specifically weight wise, 80-85 grams would be a good range to look at. The reason weight (or rather ‘lightweight’) is an important factor is because you will have better control with a badminton racket that does not weigh a lot. As you advance in your style of play (or if you are an intermediate or above player already), you might want to consider slightly heavier rackets of up to 100 grams. This is only to give you more strength in your shots; otherwise, the ‘lighter the better’ principle will continue to hold good. … More towards its head? These are the three possibilities that typically occur when it comes to the balance point of badminton rackets. The balance point of a badminton racket is determined by its length. If measuring from the bottom, without any additional grips being added, the racket would be balanced if the balance point lies around 285 or 290 millimeters. More than that would be considered head heavy while less than that would be rendered as head light. How does it matter? The more head heavy a racket is, the more power you will get in your shot. Conversely, the more head light it is, you will get less power but at the same time your maneuverability would be strengthened. With a balanced racket, you will of course be treading the middle path between these two variations. Typically, there are two possibilities when it comes to the frame or the shape of a badminton racket; either it is isometric or round. 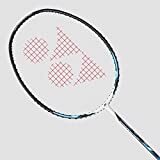 With an isometric shaped frame, you will have greater power across its entire strung area while with a round shaped badminton racket, the power will tend to be concentrated more towards its center. It is actually not very easy to distinguish an isometric frame from an oval one; novices would especially find it hard to spot the difference. However, a keen eye (and some experience!) would easily notice the square shape at the top of the racket head in an isometric frame, as opposed to an oval one (which is oval all round). The advantage of an isometric frame lies in widening the “sweet spot” of your badminton racket. As a result, you are likely to hit your shots better with such a racket. These days, most badminton rackets tend to have an isometric frame. Therefore, if you are just starting out and not sure of the frame shape to opt for, go for an isometric one (which may well be the default shape, irrespective of the racket you opt for). A conventional oval frame badminton racket is one which is oval all round; there is no such squarish touch to it at the top. While the “sweet spot” on an oval shaped frame is more concentrated, as and when you manage to hit the shuttlecock with that area, the power you get will actually be better than on an isometric shaped frame. However, this trade off rarely proves worthwhile which is why you would be better off with an isometric frame badminton racket that has a wider “sweet spot”. In any case, it is more than likely that no matter which badminton racket you opt for in contemporary times, it would have an isometric frame. A notable exception to that rule is the Yonex Carbonex series which has an oval shape. Prices of badminton rackets can vary widely. In this review, we have showcased a number of badminton rackets that do not cost a fortune yet pack a punch. In that context, we would affirm that it is really not true all the time that the more expensive a racket is, the better it is. Or that as a corollary, you will only get something inferior when you pay less for your badminton racket. Again, our reviews are a true testimony to this assertion. In this regard, let your playing style be a key factor. Are you just starting out as a beginner? It may not be wise to invest too much upfront on an expensive racket. As you improve your game, you can gradually make your way onto advanced badminton rackets that cost more. In the same breath, are you an advanced player playing in a key tournament? An inexpensive badminton racket will likely not make the cut so make sure you have a racket that fits the occasion. So as you can see, there are various factors to consider when you look at the price of a badminton racket – there are really no hard and fast rules. Today there are many good badminton racket brands. Yes, Japanese major Yonex continues to rule the roost but as our review has shown, there are other brands that have also come out with excellent badminton rackets. Li Ning for instance is a very good badminton racket brand from China. As with price above, don’t let the brand be a major factor when it comes to your selection of a badminton racket. Our reviews have shown that lesser known brands can also come out with excellent quality badminton rackets. Moreover, as you advance in your game and play at a pro level, it is more than likely you will be heavily customizing your badminton racket, working on its tension, its grip, etc. – completely to suit your own personal playing style. Under such circumstances, the brand per se will actually matter less, even though you will very likely be playing with a badminton racket from a reputed brand. Clearly, there are various types of badminton rackets out there. In this section, we will look at the more common ones. While you might desire to have both, most badminton rackets compel you to choose between these two. Multiple factors determine the extent to which your badminton racket either has power or control. A heavier racket for instance would have greater power than a lighter one. While “heavy” in this context is a relative term, anything above 100 grams without the grip and string would be considered heavy. A lighter racket on the other hand, especially one below 85 grams (again, without the grip and string of course!) would lend you better control with reduced power. The balance point of a badminton racket, which we covered in a previous section, also has a say when it comes to power vs control. A head heavy racket has greater power while a head light racket has better control. Light-headed badminton rackets are ones where the balance point is more towards the handle as opposed to the head (hence, light-headed!). These rackets throw up significant advantages. For instance, you will be able to react a lot faster to your opponent’s shots with a light-headed racket. Fatigue will also be less with these rackets as they will exert less strain on your arms and shoulders. At the same time, light-headed rackets are not as powerful as compared to heavy-headed ones. The Yonex Nanoray series that we reviewed previously is an excellent example of a light-headed badminton racket. If you have always dreamt of being an expert smasher, then a head-heavy racket is what you need! In other words, when it comes to power, head-heavy rackets rule the roost. The disadvantage is that they are not that easy to handle; you will have fairly less control with a head-heavy racket as compared to a light-headed racket. Moreover, the extra weight is likely to put pressure on your arms and shoulders, especially over longer games. Badminton rackets whose balance point lies more or less at their center are considered evenly-balanced rackets. These are midway between being head-heavy or head-light and therefore offer the advantages of both, without the degree of power seen in head-heavy rackets or control witnessed in head-light rackets. Primarily, there are three kinds of badminton racket grips. No grip is strictly better than the other; a lot depends on your playing style. In this section, we will look at all three badminton racket grips and advise you on which one would be suitable for your playing style. Before we get to that, it would be useful to understand the value-add of these grips. Firstly, they let you have a firm hold on your badminton racket which in turn optimizes your performance while playing. Moreover, they help absorb sweat from your hands while playing. Broadly, a playing style that focuses on power would see you using a thicker grip while a playing style that is centered around control would be suitable for a thinner grip. With that background in place, let’s look at the three prominent kinds of badminton grips. Ideal for power play since towel grips tend to be quite thick. At the same time, this thickness adds weight to the badminton racket which may not be suitable for all players. If you are prone to sweating profusely from your hands while playing, a towel grip would be particularly suitable for you since it absorbs sweat the best as it is usually made of cotton. As the name might suggest to you, a replacement grip is one that simply replaces the original grip which came with your badminton racket when you first bought it. The difference lies in the fact that this grip tends to be a little thicker than the original grip. Typically, a replacement grip would be made of PU or Polyurethane. This serves as a fairly good shock and sweat absorber. While being similar to replacement grips, these are called overgrips since you put them over the existing grip on your badminton racket. Also, overgrips are rarely as thick as replacement grips. Like replacement grips, overgrips are usually made of PU also and therefore, lend your hand that extra degree of comfort and sweat absorption. The strings on your badminton racket are perhaps the most important aspect of your game, after your own skills. So if there is one thing that will especially play an important role in how you perform, it would be your badminton racket strings. In this section, we look at the key aspects related to badminton strings. That will help you make the best choice of badminton racket strings and their tension for yourself. The material used for making badminton racket strings has been getting increasingly complex with time; today, there are a number of different materials that are used. Typically, nylon has been the material of choice for badminton racket strings. However, today we often we see more complex material made of polyester being used. Closely related to polyester is polyether which is also frequently used for making badminton racket strings. One instance would be a monofilament where the same material, say polyester, is used consistently. Another instance would be multifilament where multiple strands of the material are twisted together to create badminton racket strings. Yet another example would be the solid core with single wrap style of construction where the core is a thin monofilament which has a solitary layer of fibers around it. Together, you will have a good idea of the racket to go for, based on your playing style in accordance with the features of the racket in question. The way the strings on your badminton racket have been strung makes a HUGE impact on your game. Therefore, in this section we will look at multiple ways in which badminton rackets are strung and how that affects performance. One is the tautness (or tightness) of strings, i.e. how firmly they have been strung onto your badminton racket. The other is the density of strings on your badminton racket; are they criss-crossing your badminton racket head more frequently (high density) as opposed to other badminton rackets (with low density)? In this section, we will look at both these aspects and the way they impact a typical game of badminton. Firstly, when you have strings strung with relatively less tension, you will be able to exert greater power in your shots. As a corollary, a badminton racket that has its strings tightly strung will offer its user more control over the shuttlecock. Most players invariably want both power and control from their badminton rackets. So it is really about hitting the proverbial sweet spot where the tightness of strings is just right to offer an ideal mix of power as well as control. With pre-strung badminton rackets, including ones we have reviewed in this article, you will have no say on this front, at least not when you first purchase it. With time however, especially when you find the tension in your badminton racket strings wearing out, you can consider adjusting the tightness of these strings to your playing style. You can also consider getting new strings altogether. From there, you can completely customize the way they are fitted to your badminton racket to perfectly match your playing style and preference. If you are a beginner just starting out playing badminton, we suggest keeping the string tension on your badminton racket on the lower side, especially till you hit the sweet spot that we referred to above. This way, you will continue to have power in your shots (as you hope to! ), while improving control in your game as you practice (and ultimately get the string tension in your racket just right). Like tautness or tension of strings, density is again something you will not be able to determine on your own on a pre-strung racket that you purchase. However, as with tension, once the strings begin to wear a bit after reasonable usage, you could be in a position to modify the density of strings on your racket, based on its construction. The reason professional players often opt for unstrung badminton rackets is because they can modify things like string tension and density on their own. As a beginner, it will be rather challenging for you to do so on your own which is why a pre-strung racket is recommended. As you practice and learn the ropes, you could consider modifying these aspects on your badminton racket, on your own. Once you get to the stage where you are able to modify badminton strings on your own (or are perhaps already at that level), you could consider badminton strings like the BG 65 as well as the BG 80 from Yonex. The Nanogy 99, also from Yonex, is another very good option to consider. You might also want to look at the Medium Feeling Yonex BG 66 Ultimax Badminton String. As with any other item of its type, a badminton racket also has certain pivotal parts. In this section we will look at those parts and consider their impact on your game. While in the past we saw badminton rackets being made of wood, it has since largely been replaced with more convenient, lightweight, and durable material such as carbon fiber, ceramics, and metal alloys. The shaft is the portion of your badminton racket between the handle and the throat (just below the head). The shaft plays a vital role in determining the flexibility of your badminton racket. Nowadays, you will find the shaft of badminton rackets to commonly be made of graphite since it lends that additional bit of flexibility that we just referred to. Repulse: Good repulse on the shaft of a badminton racket implies reasonable flexibility. On such a racket, you will be able to hit the shuttlecock well since the shaft is flexible enough to bend and have an additional amount of thrust when you swing. Accuracy: An overly flexible shaft will hinder accuracy since the racket will bend each time you swing. Again, as with tension discussed in the previous section, it is about hitting the “sweet spot” of flexibility on your racket such that it is just enough flexible to bend when needed but only adequately and not more than desired. Frame in this context actually refers to the entire body of your badminton racket. So starting from the head at the top, continuing onto the stringed area, followed by the throat, then the shaft, and finally the handle – all constitute the frame of a badminton racket. However, more commonly it is the head with the stringed area which is referred to as the frame of a badminton racket. Additionally, as we shared above in this guide, there are two types of frames to select from: an isometric frame and a conventional oval frame. In this detailed review and buying guide, we have looked at all formidable contenders for the best badminton rackets. We believe that armed with all the information provided in this guide, you will be able to make a very well informed choice of an ideal badminton racket for yourself. As we have asserted right through this guide, there is really no ‘one size fits all’ approach that would apply with badminton rackets (as with most things in life). Instead, a lot depends on your playing style as well as your personal preference. Based on these two aspects, you should certainly be able to zero in on the top badminton racket for yourself. Along with reviewing some of the finest badminton rackets, we have also looked at various aspects to consider when choosing a badminton racket; the features that they have, and how each of those elements go onto making a difference as far as your choice of a racket is concerned. Keep all of these aspects in mind and ultimately, you will surely make the BEST selection of a badminton racket that is completely tailored to your own unique needs!